The guys are in high spirits. The launch of their first exhibition, Semangat Chandan, officiated by the Raja Muda Perak Raja Nazrin Shah ibni Sultan Azlan Muhibbudin Shah, was a success. 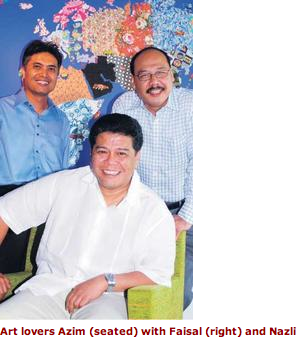 Art-lovers Nazli, 41, Faisal, 47, and Azim, 48, are bubbling over with enthusiasm as they talk about the new Galeri Chandan in Jalan Gelenggang, Bukit Damansara, Kuala Lumpur which showcases stunning pieces of art by Perak artists. As they walk me through the unique contemporary space that used to be a furniture showroom, the pride in their eyes and voices is obvious. True-blue Perakians, save for Nazli, who’s only half Perakian (his mum is from Terengganu), they tell me that the gallery was born out of a love for their ‘homeland’ which is rich in its cultural heritage. Taking a drag of his cigarette, the Cancerian continues: “I remember telling Faisal and Nazli then that maybe we should consider having a space that focuses not only on Perak art but also her culture because there’s definitely a void of it in KL. When they sat down to review top names in the local art scene, they realised that few were from Perak. When they eventually decided to proceed with the gallery, they had one condition – the opening exhibition must comprise only Perak artists. The exhibition aims to capture the point of return of the artists in their journeys – pointing to a shared sense of belonging that’s culturally driven and spiritually rooted. “Artists have their artistic journeys and along the way they’ll yearn to return to their roots. 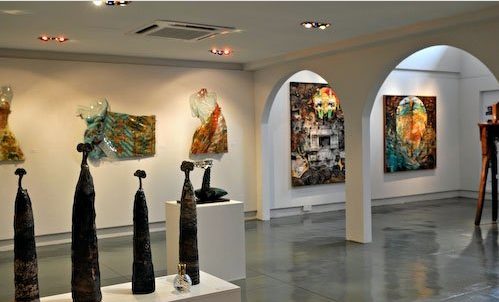 With this exhibition, it’s like a signpost for them to come back to a point of their common origin,” adds Faisal, an interior designer by profession who also has an investment in a small art gallery in Plaza Damas. 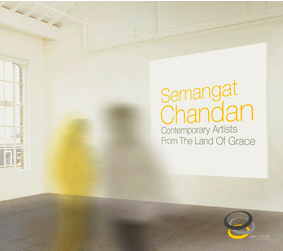 This entry was posted in art, lifestyle and tagged Contemporary Malaysian Art, Galeri Chandan, malaysian art, Perak Art, semangat chandan. Bookmark the permalink.